I love dusky purples. I think I’m pretty open about that. Heck, my website is purple, and my custom-made Edison Glenmont is purple. So I’ve always wanted to try the Scaboisa. I’ve got to say, I’m actually pretty impressed with this ink. In addition to the superb color. It goes down a dusky purple, but changes to a purplish brown over time. It’s also relatively free-flowing for an iron gall ink. It flows better for me than Diamine Registrar’s Blue. An added benefit is, of course, it’s waterproofness. All in all, an excellent iron gall ink that I’d definitely recommend to anyone who loves dusky ink colors and who is looking for a good waterproof ink. Good flow, but it does have the dry feeling that is characteristic of iron gall inks. 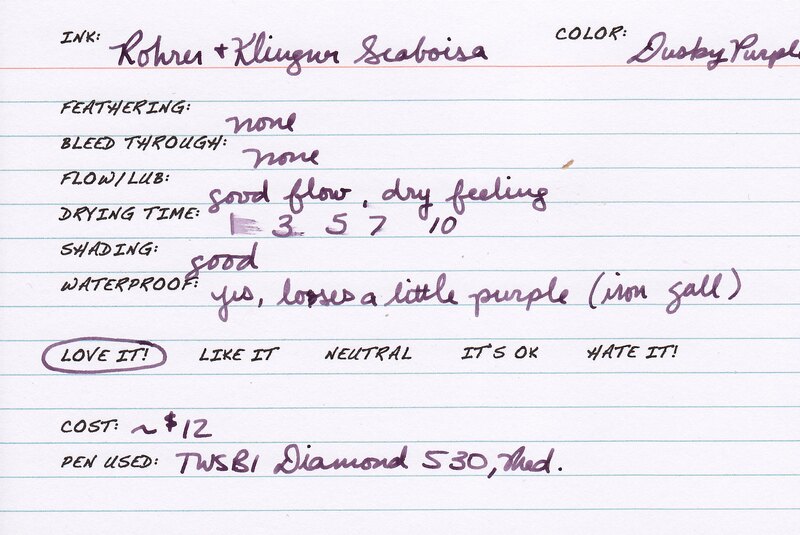 This sample was sent to me for review by Ryan at Pear Tree Pens. I am not otherwise affiliated with PTP. Lovely ink and lovely to see you here again as well. Missed you on FPN, too. Thanks Lexi. I’m glad to have a little more time for my favorite hobby!